1. Clydesdales stand at over eighteen hands tall and six feet long, and can grow to weigh more than two-thousand pounds. That calls for one huge horse bridle! 2. One of the most distinctive characteristics of Clydesdales is the long hair around their ankles, called the feather that is thought to have been developed during the first Clydesdale breeding in order to help them through the cold Scottish winters. 3. It is easy to find Clydesdale horse for sale online, and they won’t cost you an arm and a leg, as you might think. 4. In the past, Clydesdales were used for pulling farm equipment, and later as war horses. 5. Clydesdale horses can vary in color from brown, chestnut, black and bay, but are most often predominantly one color with white underbellies. 6. Queen Elizabeth II commissioned Clydesdales into royal service as a drum carrier for the Household Calvary Band. 7. 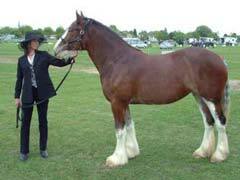 In 1975, the Clydesdale horse breed reached a dangerously low population of as little as eighty horses. Today, their population is estimated at over five thousand. 8. Clydesdale horses became the Budweiser mascot when one-time president August Busch found a Clydesdale horse-pulled Studebaker wagon outside the brewery one day. 9. One interesting characteristic of Clydesdale coloring is their black and white striped hoofs. 10. Although quite large in stature, Clydesdales are known for being extremely graceful. Next time you see the telltale horse halters and jingling bells of the Budweiser Clydesdales, remember that Clydesdales have made it a long way from pulling carts through streets. Through their many roles, these gentle giants have earned their place in history, as well as a place in our hearts.